A Hebby Repp with stylin' threads and a serious 'tude. Whatever's piped through those phones has turned its "inner emo" into "outer aggro". 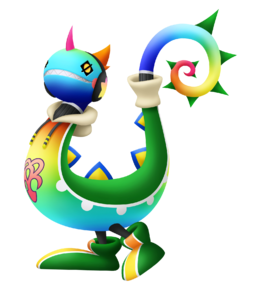 The Sudo Neku is a Dream Eater that appears in Kingdom Hearts 3D: Dream Drop Distance and can be acquired through the use of an AR Card. Resembling the Hebby Repp Dream Eater, the Sudo Neku is modeled after Neku Sakuraba. Its blue head is adorned with a pink horn and spiky orange hair. Its eyes are yellow and diamond-shaped, with circular pupils. The Sudo Neku wears a pair of black headphones covered with yellow stars. It wears what resembles a sweatshirt over its curved body, whose end is marked by a sweat band on its tail. The Sudo Neku's back and tail are covered with spikes. Its body metamorphoses from red to yellow to green to blue, and its tail changes in the opposite color scheme. The Sudo Neku wears comically large green shoes, with a yellow stripe down the center of each one. The Dream Eater emblem is present on the front of its chest. The "Sudo" in the Sudo Neku's English name is a play on "pseudo", a prefix that indicates something that is deceptively similar to another, referencing the Sudo Neku's resemblance to Neku. Its Japanese name roughly translates to "Neku-esque". The Sudo Neku Recipe is obtained in the NA and PAL versions once Sora and Riku reach Rank 20 in Flick Rush. The Sudo Neku can be created through two different recipes. The first recipe is a rank C recipe. The second recipe is a rank B recipe.